ROCKLEDGE, Florida -- Freedom Athletics moved into a new 14,000 square foot facility providing expanded cheer and tumbling classes. The new facility offers training for eleven cheer teams, dance and hip hop teams, plus numerous tumbling and cheer classes. Stunt camps,tumbling clinic, and parent night out open gym are open to the public and will be available soon. Those interested in classes available can register online at www.freedom--athletics.com and register under the I Class Pro to see details on available classes. Freedom Athletics was formed in 2003 with a passion for training cheerleading champions. Nancy McDowell and Kelly Minciler formed the gym together but a few years later Nancy McDowell bought out her partner Kelly. Kelly is still a supporter of Freedom Athletics. The original group of coaches who are still part of the gym today are Destinie (Lake) Goronto, Donna (Shipley) Schaeffer and Jennifer (Buchner) Watts. The original team fosters a sense of self confidence and achieving goals that help make Freedom Athletics cheerleaders successful in other aspects of their lives. Nancy McDowell and Donna Schaeffer are both former cheerleaders at Merritt Island High School and coached at SCC from 1991 to 2003. Destine and Jennifer, previous high school and All Star SCC cheerleaders who were actually coached by McDowell and Schaeffer. Second generation cheerleaders are a part of Freedom Athletics as well. The support of the second generation cheerleaders shows just how much confidence parents have in McDowell, Schaeffer and the Freedom staff. The cheer team names are part of the American Freedom theme. Some of the All Star cheer team names include: Eagles, Spirit, Honor, Promise, Loyalty, Patriots, United, Glory, Legends, Liberty, Courage, Privilege and Veterans. Over the nine years in competition Freedom All Star cheerleaders have earned several state and national champions. The company recently expanded to offer more tumbling classes, dance and special needs cheer. At the present time there are now NINE cheer teams, ONE Special Needs team and ONE hip hop team. 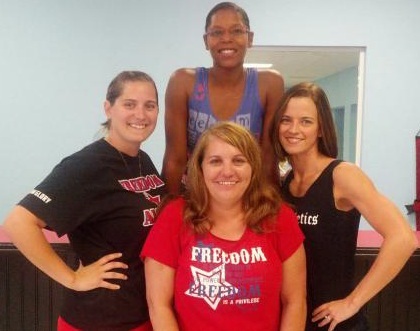 Freedom Athletics also offers cheer, tumbling classes, zumba, kung fu. New classes are being added often with the hopes of expanding classes in a variety of options. Community involvement is also a big part of Freedom Athletics. Freedom Athletics cheer leaders will be participating in the upcoming breast cancer walk at “The Avenues at Viera” and each of the nine all star cheer teams provides a thanksgiving basket for needy families as part of their giving back to the community. At the present time Freedom Athletics is raising money for a former cheerleader who is suffering from a brain tumor by selling her favorite cheer bow. As a result of the all star training and community involvement many of the former Freedom All Star cheerleaders are confident, successful and involved in their community. 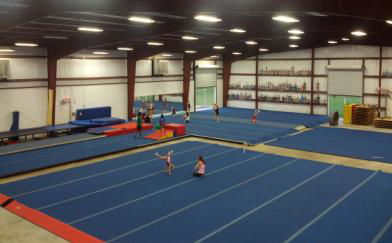 Freedom Athletics moved into a new 14,000 square foot facility providing expanded cheer and tumbling classes. The new facility offers training for eleven cheer teams, dance and hip hop teams, plus numerous tumbling and cheer classes. Stunt camps,tumbling clinic, and parent night out open gym are open to the public and will be available soon. Those interested in classes available can register online at www.freedom--athletics.com and register under the I Class Pro to see details on available classes. For details on Freedom Athletics call Nancy McDowell at 321-632-3737 or online at www.freedomathletics.com.